Sorry I’m late! Get to the pub.com has been away on a family holiday. This presented a pleasant opportunity to spend some quality time with some of the pubs of the southern Peak District. But it also means this will be the briefest of weekly round-ups, while I try and catch up and generally get back on track. Normal service will be resumed next week. Sheffield Tap, Sheffield (featured here); Henry’s, Cambridge Street, Sheffield. This seems so long ago now that I can barely remember it. Rutland Arms, Brown Street, Sheffield (featured here); The Washington, Fitzwilliam Street, Sheffield. It’s starting to become beer garden season proper, and it’s accordingly packed out the back of the Rutland tonight. But the noteworthy pub visit of the night is to the Washy. Surprisingly given how often I used to roll up here, it’s my first time here in 2010. The DJ from Sheffield’s uber-hip Death By Shoes night is here, spinning some tunes that aren’t too hip for me to know. Well, I recognised the Lush track anyway. It’s good to be back at the Washy. Let’s hope it isn’t inundated this summer by a high tide of shouty men punching each other in the beer garden. 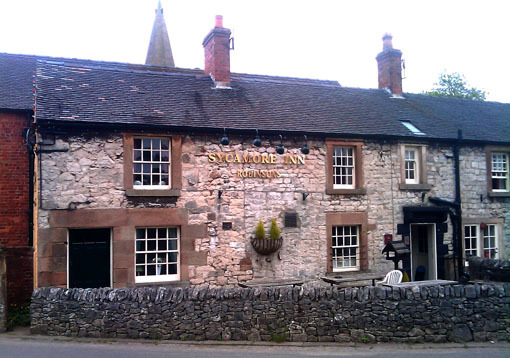 Sycamore Inn, Parwich, Derbys. Where the streets have no name – or at least where the village is so small that Get to the pub.com can’t find them despite a reasonably thorough Google search. That’s where the Sycamore sits. In many ways it’s a perfect village local – which is why it’ll become this website’s next featured pub. Look out for that soonish! I’m looking forward to reading your review of The Sycamore, as I’ve been there several times (not for a while, though). It’s about time you got to The Plough, in Two Dales!